HOPE & HEALING. PREVENTION. EDUCATION. GLOBAL. BEDROCK Counseling Ministries is a Christian out-patient center with a mission to bring hope to the hopeless and healing to those who are hurting and to help individuals realize their god-given, divine potential. What sets BEDROCK apart from other counseling centers is the holistic approach that provides a unique blend of Biblical and Christian values with a psychological and clinical perspective. This approach maximizes spiritual and life potential for children, teens and adults. BEDROCK Counseling Ministries is a not-for profit that partners with local churches and district ministry organizations. It helps individuals, ministers, marriages and their families find hope and healing through Christ Jesus. 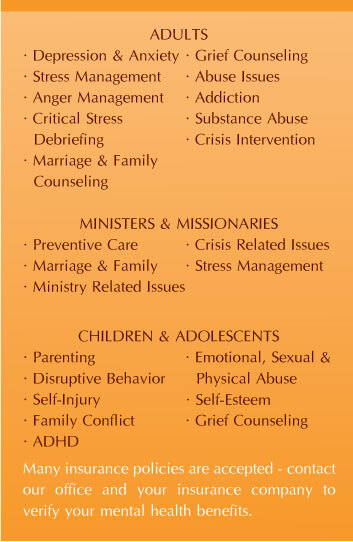 Many lives have been wonderfully restored through these counseling services! BEDROCK’s licensed clinicians combine psychological principles with Christian faith, allowing them to come alongside the client with godly wisdom. BEDROCK equips ministers, missionaries, counselors, church and community leaders locally and internationally through seminars and classes that impart practical wisdom. These forums range from helping leaders focus on a specific population or age group within their community or are used to help expand a leaders capacity for caring for others. Professional and Community seminars, retreats and conferences are offered for Christian leaders, churches, professionals and the general public. Counseling is not just for those who are in the midst of a crisis, but are using our services to help sharpen their life skills to proactively prevent future crisis. We are a community and global resource center that provides counseling services, seminars, life coaching and classes that impart practical wisdom for facing many of life’s circumstances like preparation for ministry, premarital counseling and marriage enrichment retreats. Where does a pastor or missionary go for confidential help with a personal, marital or family crisis? Thousands of ministers, missionaries and their families around the world have been cared for by this counseling ministry. Using “block” scheduling, several appointments are planned over a period of a few days to maximize time and availability. Assessments provide a clinical “snapshot” that helps the client identify and prevent issues before they begin.